If your family likes chicken noodle soup like my family does then be sure to make it to Walgreen’s this week. Healthy Request soup, any variety, is on sale 4/$5. That is a good deal in itself but combine that with two $0.75/2 coupons from the 10/26 insert and it makes each soup just 87 cents. Also on sale are Campbell’s Select Harvest soup 4/$5 and could be combined with the $0.50/2 coupons from the 10/05 insert. Combine that with the Schick Razor deal that has a $2.01 overage and you only have to pay $1.46 OOP! In this particular deal I bought the two packs of razors, four packs of gum and the four soups and paid only the $1.46 due to all the BOGO coupons. If you haven’t been saving all the coupons yet and don’t have these coupons or enough of them, don’t despair. This is just one more example of the deals to be had to encourage you to keep clipping and soon you will be reaping the benefits. 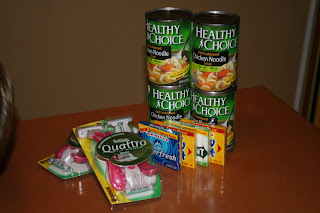 This is also an example that you can get healthy food from couponing, not just razors and gum.